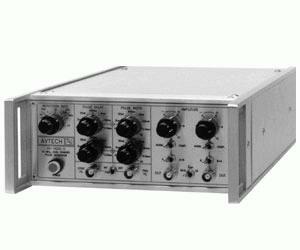 lab pulse generator and delay generator providing 0 to ±10 Volts, 10 ns rise time, variable pulse widths and delays, self-explanatory front panel controls and a heavy-duty metal chassis for low emissions and decades of trouble-free service. Channels A and B share a common trigger source, but have independently controlled delays, pulse widths, polarities, and amplitudes. The two output channels can be summed together, if desired. Channels A and B may be polarity-inverted (i.e. from positive to negative voltages) or logic-complemented (i.e. high and low voltage levels reversed) to provide a wide variety of output waveforms. The output impedance can be set at 50W (for transmission-line backmatching) or at 1W for maximum voltage output. With this degree of versatility, the AV-1023-C is a general-purpose workhorse - perhaps the only pulser-delay generator that you'''ll ever need!